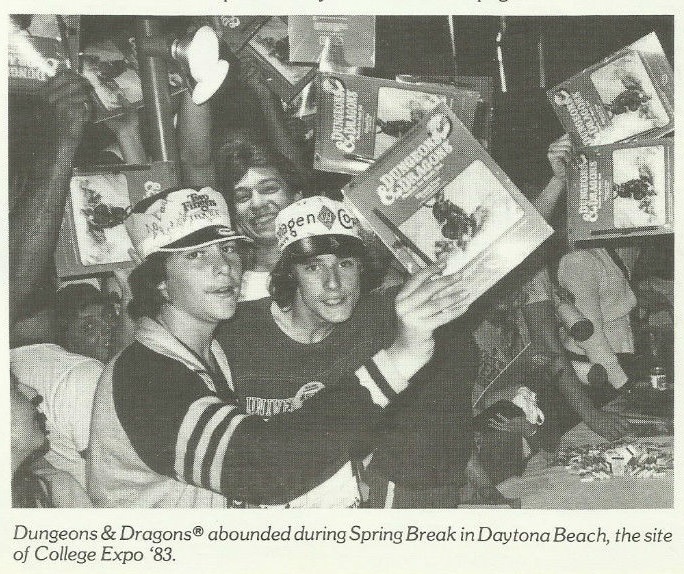 Apparently TSR had a booth at something called “College Expo” during Spring Break of 1983. Apparently TSR gave away lots of swag, including Blizzard Pass, the first solo adventure module. Apparently the TSR booth was sponsored by Casey Kasem’s American Top 40. Apparently 6000 t-shirts featuring both the D&D logo (front) and the American Top 40 banner (back) were made for the event. Conclusion: somewhere out there, probably covered in 32-year-old beer and puke and unused condoms, is a t-shirt featuring both the D&D logo and the American Top 40 banner. Random Events was an internal TSR newsletter that ran from 1981 to 1983. I don’t have the second page of this issue, unfortunately, but you can read more at The Acaeum. Are we to believe that some ABC media rep convinced TSR that the American Top 40 demographic and the Star Frontiers target audience were one in the same? It’s strange, alright. American Top 40 and Spring Break? Talk about hubris and a bridge too far. And the cartoon was on CBS.